Grout is used for the parts of your home that get more, if not the most, exposure: walls and floors. This means that grout is more prone to bacteria, stains, and water. All of these things are damaging to your grout but can actually be bad for your health because they can breed germs, mold, and mildew. Porous cement surfaces such as grout are absorbent by nature, so without protection, you and your family have to deal with unsightly stains and germ-filled walls and floors. Grout joints, in particular, are notoriously challenging to clean. You can use DIY solutions that involve a spray bottle and a cleaning solution, then spend hours cleaning grout joints regularly. Or you could just seal your grout joints in the first place. 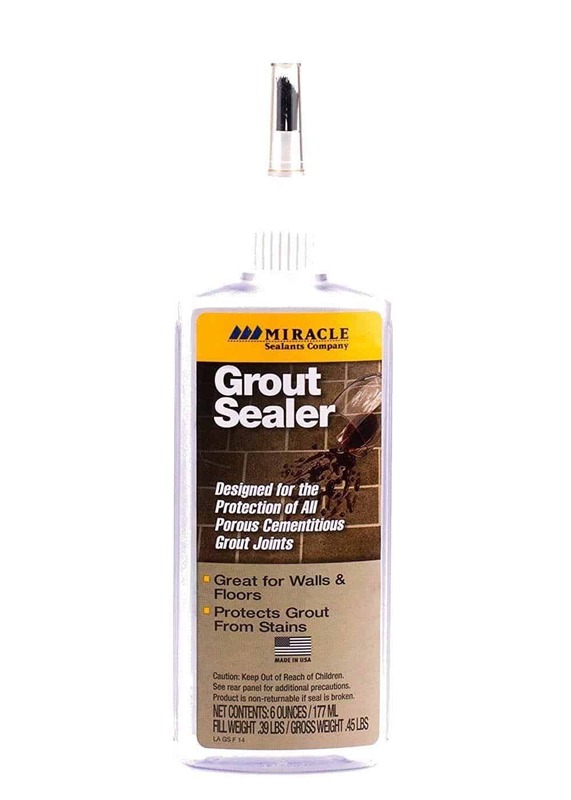 Miracle Sealants Grout Sealer in an applicator bottle is the ideal product for sealing tricky grout joints. Formulated to work with all sanded and non-sanded grout joints, it works by forming an invisible barrier that works overtime to resist stains and moisture while preventing vapor from escaping. Miracle Sealants Grout Sealer simply makes the job of taking care of your grout joints so much easier because this sealant already comes with a convenient applicator tip. Use it on grout joints inside and outside your home; you can’t go wrong with this easy-to-use bottle and formula. Kitchen counters and floors, bathroom showers and floors, and service porches can now be kept germ-free and sparkling clean when you use Miracle Sealants Grout Sealer. Once you apply Miracle Sealants Grout Sealer, your floors and porches can be made much safer because they are less slippery. It will work well in just about any kind of weather because it’s resistant to thawing and freezing, acid, and saltwater. Best of all, it’s UV transparent and won’t change the look of your grout at all. No other grout sealer in the market has been made to care for your grout joints the way Miracle Sealants Grout Sealer can. Miracle Sealants Grout Sealer does a great job at all-around grout sealing and protection. One application of this sealer protects your grout joints from accumulating both staining and invisible contaminants. Not only does it keep your home looking clean, but it also minimizes the time involved in cleaning. It isn’t much to ask for a product to do as it advertises, though many sealers out there find that a tall order. That isn’t the case with Miracle Sealants Grout Sealer because it works. Miracle Sealants Grout Sealer comes in a 6-ounce bottle. This is enough for covering 60 to 115 square feet of grout joints. However, how much grout it can seal will depend on the grout’s density porosity, surface absorption, application method, texture, and the weather. Miracle Sealants Grout Sealer is so easy to use. For new installations, make sure that the grout or mortar is cured well based on the manufacturer’s directions. Apply the sealer using its applicator tip directly to the grout joint; if you find yourself with any excess sealer on the tile or stone, just wipe it off with a clean towel. Avoid letting the sealer form puddles on surfaces. When working on existing installations, clean then dry the grout or mortar. It’s necessary to make sure that you’re working on a surface that is completely free from dirt, grime, hard water deposits, rust, efflorescence, even old coats of previously applied sealers. Miracle Sealants recommends working with specific products for effective cleaning, whether you have to do light or heavy duty cleansing so you might want to check those out too. Allow Miracle Sealants Grout Sealer to dry for 1-3 hours, after which it should be dry to the touch. However, they recommend letting your surface be free from exposure to materials that may stain for 72 hours. The bottle comes with detailed instructions, so for best results, be sure to follow the directions to a T.
All of this for a super affordable price. When it comes to sealing grout joints and keeping them looking great, Miracle Sealants Grout Sealer is the way to go. We investigated customer reviews online to see if Miracle Sealants Grout Sealer was satisfactory to the number one judges: homeowners themselves. Homeowners say that Miracle Sealants Grout Sealer has worked the best compared to other sealers they have worked with in the past. They point out that it only has to be applied once to work well, whereas competitors required additional coats to be effective. This sealer has been used in many parts of the house and performed well no matter where it was used. Although it tends to drip when applying, they recommend holding a paper towel in your other hand as you apply it. On the other hand, some homeowners found this sealer messy to apply. They also commented that it did alter the color of the grout. Only very few people said that this product didn’t do anything for them. Overall, Miracle Sealants Grout Sealer seems to impress a lot of homeowners. This is certainly the sealer you can trust. There’s no need to go through the hassle of finding Miracle Sealants Grout Sealer. With a few clicks from an online retailer, this sealer can be shipped to your doorstep within a few days. Check out your preferred online home depot, though Amazon is known for great deals and speedy delivery. Don’t be like the other homeowners who had to experiment with several sealers until they discovered how effective Miracle Sealants Grout Sealer is. You don’t want to make the mistake of having your grout joint stained, discolored, damaged, or filled with contaminants by the time you apply it. This is your partner in grout protection and contaminant prevention!